My name is Cesar Ambrosio from Mexico City, Mexico. I am a Visual Arts graduate but today I have a sporting goods store in which I design aquariums upon request. My interests focus on the appreciation for images (pictures, paintings, posters, graffiti, etc.). I deem pictures tell the story of the world in a better way. Another thing I am passionate about is observing nature in every detail and aspect, small or large, since everything within nature is captivating. Since childhood, I have enjoyed aquariums; however, it was not until 2008 when I started maintaining conventional aquariums. 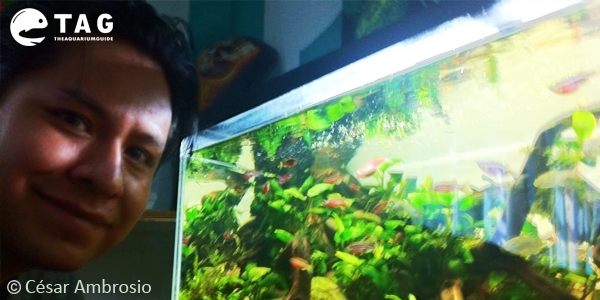 Then in 2012, I was assigned a final Project for my degree in the School of Arts for which I created an aquascape. There are different styles of aquascaping out there, what’s your favorite one and why? This is a difficult question because each style has characteristics that are interesting, but my favorites are the landscapes with mountains since I live in a city surrounded by them. I find the mountains captivating; to behold an aquarium reminiscent of the peaks of your city shows beauty and culture. 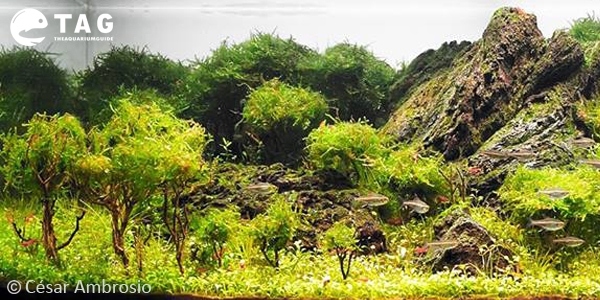 What I like and put into practice in my tanks is the use of volcanic rock, as it is very easy to find in my area and is perfect to create mountainous landscapes. If you are interested to use volcanic rocks for your own aquarium, you can get some here. I live in a city where there are few opportunities to appreciate nature, but is equally surrounded by mountains that extend to the edge of the city. You can find beautiful landscapes that inspire and provoke you if you observe the small details. I prefer to ride bike to places with vegetation to enjoy and explore different views of nature to get ideas for different designs. My favorite plant is the Anubia for its ease and strength on and off the water, but also its wild curves and forms. In addition, I like the way its roots are subjected to the elements that are nearby. A fish that I would like to have, but does not get along very well with delicate aquarium plants, is the goldfish. It is a shame I cannot see a large goldfish swimming in the mountain area in which I live. 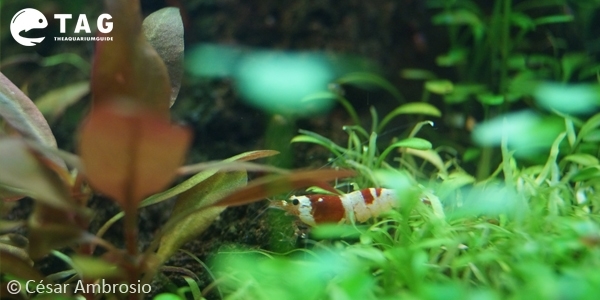 I also like shrimps; this aquarium inhabitant works within a planted aquarium and makes the best company. Beyond that, I can spend hours observing their behavior and never get bored. It is a 33 gallon aquarium with a dimension of 90cm x 40cm x 35cm. I’ve installed two 28w bulbs with a T5 canister filter 206. For this tank, I’ve used river rocks and roots of Manzanita. And to create the kind of effect that I wanted, I used an inert substrate mixed with sand. 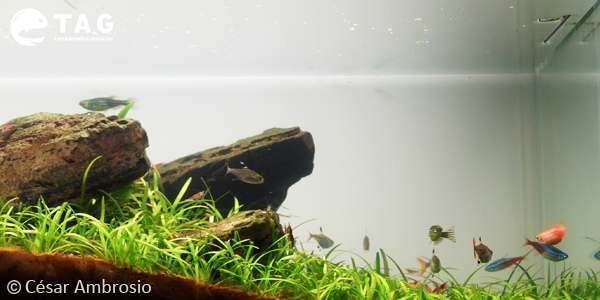 I’ve chosen some easy to maintain plants to keep its CO2 requirement to a minimal. This way, I’m able to opt for substitute CO2 (carbon plus the azoo mark) instead of a proper CO2 system. To ensure that my tank gets enough nutrients, I’m using the Seachem Aquavitro Nutrients. This tank receives 8 hours of light each day. I am also working on the design for the next aquarium that I will be using to participate in the International Aquatic Plants Layout Competition (IAPLC) 2016 and a small one for the Aquatic Gardeners Association (AGA). In Mexico, designing planted aquariums is becoming more popular recently. I have especially noticed more and more people asking in the store about planted aquariums. I hope this will continue to grow and allow Mexicans to have greater participation in international events because I think Mexico has a significant natural wealth that serves as a source of inspiration to carry a high-level of aquarium design. 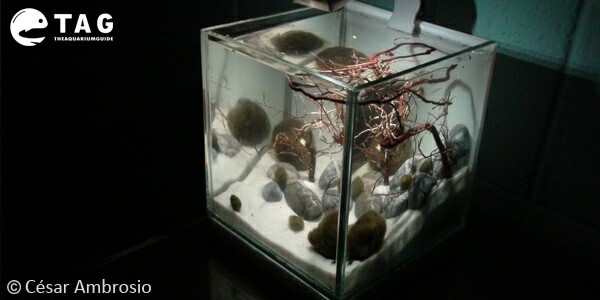 An obstacle to its development can be the cost involved to keep an aquarium of this type and size considering the materials still are costly, which discourages many people, but there a few fellow aquarists that facilitate this problem by developing homemade methods and tools that allow us to maintain an aquarium of these characteristics. Planted aquariums symbolize the desire to control nature by human beings; as humans, we want to grow at the pace we desire, but you have to let nature develop by itself in an aquarium. By giving the necessary care, you will see your aquarium grow day by day. Aquariums not only decorate our house; they are a window to the world, a piece of nature that reminds us how fragile and delicate it is and, therefore, we must take care of it and respect it. 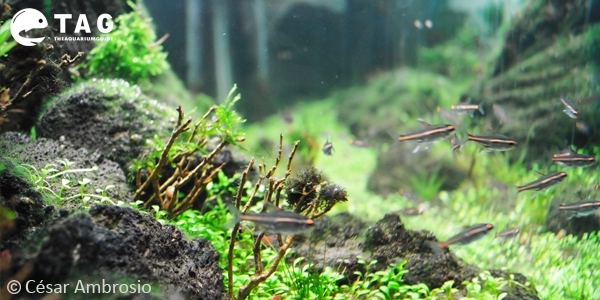 You can find out more about my aquascape projects on my blog – www.dracoyluna.blogspot.com. I can also be contacted via my facebook account (Cesar Ambrosio) or you can send me an email at acdeportes@hotmail.com.